An Online Workout Guide For Just $10! Please note, this program is a self-paced, do-it-yourself program. There is no coach or trainer associated with this program. However, if you need any technical support, please contact [email protected] Please remember to take these workouts at your own pace, use modifications, challenge yourself and have fun! Elevation Corporate Health’s downloadable programs are non-refundable from the moment of purchase. If for whatever reason you are dissatisfied, have any unanswered questions or are having trouble downloading the file, we provide full assistance to resolve any question or problem you may have. Once you make your purchase, you will receive an email with a link to download. We are not responsible for lost or forgotten emails, or lack of download on the consumers' part for any reason. Please consult with your physician before beginning any new exercise or nutrition plan. The information provided with this plan is intended for general information only. It does not include individualized recommendations and is not intended as medical advice. Health information changes frequently as research continually evolves. You should not rely on any information gathered here as a substitute for consultation with medical professionals. You will not be monitored by a health/fitness professional during this program therefore you should complete this program at your own pace and risk. All rights reserved, including the right to reproduce, copy, print, share or transmit this book or portions thereof in any form. Unauthorized reproduction, in any manner is prohibited. Add a 2nd Workout Guide for just $10 and save $5 - an offer you won't see anywhere else on our site! After purchasing, you'll get an email to select which Workout Guide you'd like! Yes! Add An Online Workout Guide For Just $10! 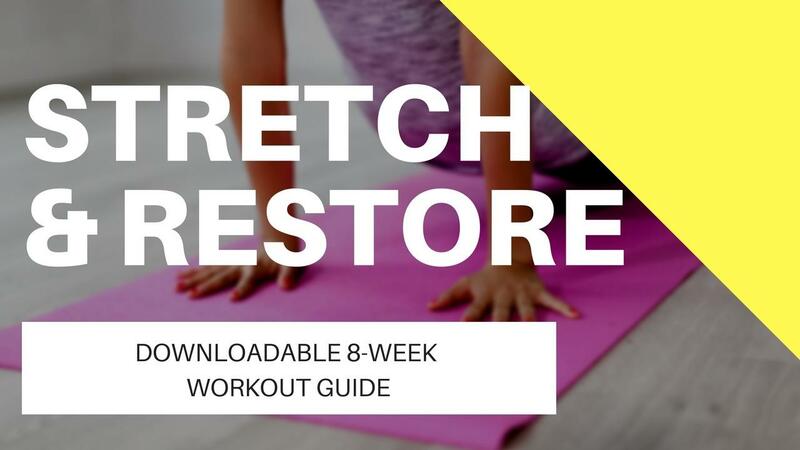 This program is comprised of 8 different stretching routines; each targeting specific muscle groups for a total body stretch that will increase your flexibility, range of motion, balance and posture. This program is designed for all fitness levels and will compliment and help bring balance to your current workouts as well as increase functionality and mobility in everyday tasks. Please note: This program is most beneficial if your body is already warmed up. A great end to any workout or other physical activity! All of our programs were designed by Certified Personal Trainers from Elevation Corporate Health. Upon purchase, you’ll receive an email confirmation including your downloadable PDF workout for immediate use.